NuSTAR (Nuclear Spectroscopic Telescope Array) is a space-based X-ray telescope that uses a conical approximation to a Wolter telescope to focus high energy X-rays from astrophysical sources, especially for nuclear spectroscopy, and operates in the range of 3 to 79 keV. NuSTAR is the eleventh mission of NASA's Small Explorer satellite program (SMEX-11) and the first space-based direct-imaging X-ray telescope at energies beyond those of the Chandra X-ray Observatory and XMM-Newton. It was successfully launched on 13 June 2012, having previously been delayed from 21 March due to software issues with the launch vehicle. The mission's primary scientific goals are to conduct a deep survey for black holes a billion times more massive than the Sun, to investigate how particles are accelerated to very high energy in active galaxies, and to understand how the elements are created in the explosions of massive stars by imaging the remains, which are called supernova remnants. After a primary mission lasting two years (to 2014) it is now in its fifth year in space. NuSTAR's predecessor, the High Energy Focusing Telescope (HEFT), was a balloon-borne version that carried telescopes and detectors constructed using similar technologies. In February 2003, NASA issued an Explorer Program Announcement of Opportunity. In response, NuSTAR was submitted to NASA in May, as one of 36 mission proposals vying to be the tenth and eleventh Small Explorer missions. In November, NASA selected NuSTAR and four other proposals for a five-month implementation feasibility study. In January 2005, NASA selected NuSTAR for flight pending a one-year feasibility study. The program was cancelled in February 2006 as a result of cuts to science in NASA's 2007 budget. On 21 September 2007 it was announced that the program had been restarted, with an expected launch in August 2011, though this was later delayed to June 2012. The principal investigator is Fiona A. Harrison of the California Institute of Technology (Caltech). Other major partners include the Jet Propulsion Laboratory (JPL), University of California at Berkeley, Technical University of Denmark (DTU), Columbia University, Goddard Space Flight Center, Stanford University, University of California, Santa Cruz, Sonoma State University, Lawrence Livermore National Laboratory, and the Italian Space Agency (ASI). NuSTAR's major industrial partners include Orbital Sciences Corporation and ATK Space Components. NASA contracted with Orbital Sciences Corporation to launch NuSTAR (mass 772 pounds (350 kg)) on a Pegasus XL rocket for 21 March 2012. It had earlier been planned for 15 August 2011, 3 February 2012, 16 March 2012, and 14 March 2012. After a launch meeting on 15 March 2012, the launch was pushed further back to allow time to review flight software used by the launch vehicle's flight computer. The launch was conducted successfully at 16:00:37 UTC on 13 June 2012 about 117 nautical miles south of Kwajalein Atoll. The Pegasus rocket was dropped from the L-1011 'Stargazer' aircraft. On 22 June 2012 it was confirmed that the 10 m mast was fully deployed. Unlike visible light telescopes – which employ mirrors or lenses working with normal incidence – NuSTAR has to employ grazing incidence optics to be able to focus X-rays. For this two conical approximation Wolter telescope design optics with 10.15 metres (33.3 ft) focal length are held at the end of a long deployable mast. A laser metrology system is used to determine the exact relative positions of the optics and the focal plane at all times, so that each detected photon can be mapped back to the correct point on the sky even if the optics and the focal plane move relative to one another during an exposure. Each focusing optic consists of 133 concentric shells. One particular innovation enabling NuSTAR is that these shells are coated with depth-graded multilayers (alternating atomically thin layers of a high-density and low-density material); with NuSTAR's choice of Pt/SiC and W/Si multilayers, this enables reflectivity up to 79 keV (the platinum K-edge energy). The optics were produced, at Goddard Space Flight Center, by heating thin (210 µm) sheets of flexible glass in an oven so that they slump over precision-polished cylindrical quartz mandrels of the appropriate radius. The coatings were applied by a group at the Danish Technical University. The shells were then assembled, at the Nevis Laboratories of Columbia University, using graphite spacers machined to constrain the glass to the conical shape, and held together by epoxy. There are 4680 mirror segments in total (the 65 inner shells each comprise six segments and the 65 outer shells twelve; there are upper and lower segments to each shell, and there are two telescopes); there are five spacers per segment. Since the epoxy takes 24 hours to cure, one shell is assembled per day – it took four months to build up one optic. The expected point spread function for the flight mirrors is 43 arc-seconds, giving a spot size of about two millimeters at the focal plane; this is unprecedentedly good resolution for focusing hard X-ray optics, though it is about one hundred times worse than the best resolution achieved at longer wavelengths by the Chandra X-ray Observatory. Each focusing optic has its own focal plane module, consisting of a solid state cadmium zinc telluride (CdZnTe) pixel detector  surrounded by a CsI anti-coincidence shield. One detector unit — or focal plane — comprises four (two-by-two) detectors, manufactured by eV Products. Each detector is a rectangular crystal of dimension 20mm x 20mm and thickness ~2mm that have been gridded into 32 × 32, 0.6 mm pixels (each pixel subtending 12.3 arc seconds) and provides a total of 12 arc minute field of view for each focal plane module. CZT detectors are state-of-the-art room temperature semiconductors that are very efficient at turning high energy photons into electrons. The electrons are digitally recorded using custom Application Specific Integrated Circuits (ASICs) designed by the NuSTAR Caltech Focal Plane Team. Each pixel has an independent discriminator and individual X-ray interactions trigger the readout process. On-board processors, one for each telescope, identify the row and column with the largest pulse height and read out pulse height information from this pixel as well as its eight neighbors. The event time is recorded to an accuracy of 2 μs relative to the on-board clock. The event location, energy, and depth of interaction in the detector are computed from the nine-pixel signals. The focal planes are shielded by cesium iodide (CsI) crystals that surround the detector housings. The crystal shields, grown by Saint-Gobain, register high energy photons and cosmic rays which cross the focal plane from directions other than the along the NuSTAR optical axis. Such events are the primary background for NuSTAR and must be properly identified and subtracted in order to identify high energy photons from cosmic sources. The NuSTAR active shielding ensures that any CZT detector event coincident with an active shield event is ignored. NuSTAR has captured these first, focused views of the supermassive black hole at the heart of our galaxy in high-energy X-ray light. NuSTAR has proven itself to be a versatile instrument and has opened up new discoveries in wide and varied areas of astrophysical research since it launch. In February 2013, NASA revealed that NuSTAR, along with the XMM-Newton space observatory, has measured the spin rate of the supermassive black hole at the centre of the galaxy NGC 1365. Black hole with corona, an X-ray source (artist's concept). One of NuSTAR's main goals is to characterize stars' explosions by mapping the radioactive material in a supernova remnant. The NuSTAR map of Cassiopeia A shows the titanium-44 isotope concentrated in clumps at the remnant's center and points to a possible solution to the mystery of how the star exploded. When researchers simulate supernova blasts with computers, as a massive star dies and collapses, the main shock wave often stalls and the star fails to shatter. The latest findings strongly suggest the exploding star literally sloshed around, re-energizing the stalled shock wave and allowing the star to finally blast off its outer layers. In January 2017, researchers from Durham University and the University of Southampton, leading a coalition of agencies using NuSTAR data, announced the discovery of supermassive black holes at the center of nearby galaxies NGC 1448 and IC 3639. ^ a b c d "Nuclear Spectroscopic Telescope Array, or NuSTAR" (PDF). June 2012. Retrieved 16 June 2012. ^ a b c d "NuSTAR (Nuclear Spectroscopic Telescope Array)". eoPortal. European Space Agency. Retrieved 2 July 2015. ^ a b Ray, Justin. "Mission Status Center". Spaceflight Now. Retrieved 13 June 2012. ^ "NUSTAR - Orbit". Heavens Above. 3 November 2017. Retrieved 3 November 2017. ^ "About". NuSTAR. Caltech. Retrieved 15 October 2017. ^ Clavin, Whitney; Perrotto, Trent J.; Diller, George (16 March 2012). "Launch of NASA's NuSTAR Mission Postponed". NASA. Retrieved 15 October 2017. ^ a b c "NASA Selects Explorer Mission Proposals for Feasibility Studies (03-353)" (Press release). ^ Clavin, Whitney (13 June 2017). "NuSTAR's First Five Years in Space". Caltech. Retrieved 16 October 2017. ^ "NASA Selects Explorer Mission Proposals for Feasibility Studies (03-353)" (Press release). Dwayne Brown, NASA. 4 November 2003. Retrieved 20 July 2011. ^ "NASA Selects Small Explorer Mission (05-026)" (Press release). Dolores Beasley/Gretchen Cook-Anderson, NASA. 26 January 2005. Retrieved 20 July 2011. ^ "NASA Restarts Telescope Mission to Detect Black Holes (07-198)" (Press release). Grey Hautaluoma, NASA. 21 September 2007. Retrieved 20 July 2011. ^ "NASA Restarts Telescope Mission to Detect Black Holes". NASA/JPL. 21 September 2007. Retrieved 20 July 2011. ^ Staff writers (21 September 2007). "NASA Plans Black Hole Finder". SPACE.com. Retrieved 20 July 2011. ^ a b "NuSTAR". NASA. ^ Nelson, Jon (4 September 2009). "NASA Approves X-ray Space Mission". NASA/JPL. Retrieved 20 July 2011. ^ Clavin, Whitney; Perrotto, Trent J; Diller, George (16 March 2012). "Launch of NASA's NuSTAR Mission Postponed". NASA.gov. Retrieved 31 May 2012. ^ "NASA Selects Orbital's Pegasus Rocket to Launch NuSTAR Space Science Satellite". Orbital. 18 February 2009. Retrieved 20 July 2011. ^ Moskowitz, Clara (13 June 2012). 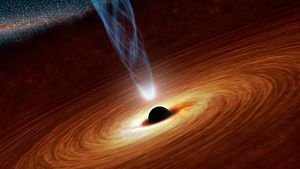 "NASA blasts NuSTAR telescope into orbit to hunt black holes". MSNBC. Retrieved 15 June 2012. ^ "NuSTAR Successfully Deploys Huge Mast". 22 June 2012. ^ "NuSTAR optics". Archived from the original on 30 June 2012. ^ Hailey, Charles J.; An, HongJun; Blaedel, Kenneth L.; Brejnholt, Nicolai F.; Christensen, Finn E.; et al. (29 July 2010). "The Nuclear Spectroscopic Telescope Array (NuSTAR): optics overview and current status" (PDF). Proceedings of the SPIE. 7732. Bibcode:2010SPIE.7732E..0TH. doi:10.1117/12.857654. Archived from the original (PDF) on 19 July 2011. ^ Harrison, Fiona. Semiconductor radiation detection systems. Boca Raton, FL: CRC Press. ISBN 9781439803851. ^ Rana, Vikram (2009). "Development of focal plane detectors for the Nuclear Spectroscopic Telescope Array (NuSTAR) mission". Proc. SPIE. 7435. doi:10.1117/12.825418. ^ Kitaguchi, Takao (2011). "Spectral calibration and modeling of the NuSTAR CdZnTe pixel detectors". Proc. SPIE. 8145. arXiv:1109.0378. doi:10.1117/12.896972. ^ "NASA's NuSTAR Helps Solve Riddle of Black Hole Spin". NASA. 27 February 2013. Retrieved 3 March 2013. ^ a b Clavin, Whitney; Harrington, J. D. (12 August 2014). "NASA's NuSTAR Sees Rare Blurring of Black Hole Light". NASA. Retrieved 12 August 2014. ^ "NASA's NuSTAR Untangles Mystery of How Stars Explode". JPL. 19 February 2014. Retrieved 24 April 2015. ^ Landau, Elizabeth (7 January 2017). "Black Holes Hide in Our Cosmic Backyard". NASA. Retrieved 7 January 2017. ^ Annuar, A.; Alexander, D. M.; Gandhi, P.; Lansbury, G. B.; Asmus, D.; et al. (January 2017). "A New Compton-thick AGN in our Cosmic Backyard: Unveiling the Buried Nucleus in NGC 1448 with NuSTAR". The Astrophysical Journal. 836: 165. arXiv:1701.00497. Bibcode:2017ApJ...836..165A. doi:10.3847/1538-4357/836/2/165. ^ Boorman, Peter G.; Gandhi, P.; Alexander, D. M.; Annuar, A.; Ballantyne, D. R.; et al. (December 2016). "IC 3639—a New Bona Fide Compton-Thick AGN Unveiled by NuSTAR". The Astrophysical Journal. 833 (2). 245. arXiv:1610.08997. Bibcode:2016ApJ...833..245B. doi:10.3847/1538-4357/833/2/245. Wikimedia Commons has media related to NuStar. Craig, David J. (Spring 2010). "X-Ray Specs" (PDF). Columbia: 24–27. Harrison, Fiona A.; Boggs, Steve; Christensen, Finn; Craig, William; Hailey, Charles; et al. (29 July 2010). "The Nuclear Spectroscopic Telescope Array (NuSTAR)" (PDF). Proceedings of the SPIE. 7732. arXiv:1008.1362. doi:10.1117/12.858065. Archived from the original (PDF) on 17 July 2011.